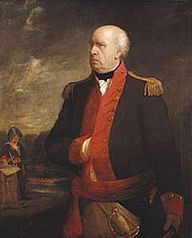 Sir William Congreve - Constance's Great Great Grandfather. My mother was born a Hunter and her brother, Alastair, has continued our branch of the Hunters for eighty six years. The Hunters of the past would be proud of what he and Melody have achieved over the years. The Hunters are very much alive and well in Yorkshire and Canada. Our branch of the Hunters goes back over 250 years to the east coast of Scotland and Aberdeenshire. From Old Machar to Newhills, from Peterculter to Chapel of Garioch, the Hunters have farmed, fished, weaved and cut stone. I’ve chosen to start their story at the beginning, chronologically speaking, with William Hunter and his children. They were born in Newhills which lies four miles north-west of the city of Aberdeen. William Hunter and his Children. I have no definite information about William at all, not even the name of his wife, but His children are well documented at FamilySearch with christening dates, and with William given as their father but no mother named. Whether William also grew up in Newhills, as his children did, is not known, nor whom his parents were. A possible candidate for our William is the one born in Fyvie, Aberdeenshire on 23 January 1750. A better one is the William Hunter born on November 29th, 1745 in Old Machar, Aberdeen. Newhills is part of this parish. His father was Andrew Hunter. William's son, Alexander, named his first son Andrew. So far, so good. You can see Newhills Cemetery above. However Alexander didn't name any of his nine daughters Anne, which was the name of this William's mother. Experience shows that names play an important part in any family history. William's only daughter, Margaret, named her first daughter Jean, and her second daughter Isobel. Therefore either could have been named after either her mother or her grandmothers. Still no sign of our Old Machar William's mother Anne. William must have married around 1773 because his first child was born early in 1774. A William Hunter married Jean Gillmore at Ardrossan, Ayr on November 25th, 1772. However the distance from Ayr to Aberdeen is 150 miles. A Margaret Ogilvie was born in Old Meldrum on 17 August, 1752, and William had a daughter named Margaret. However, the name of William's wife must for now remain uncertain. Enough of speculation, it's time to record concrete facts. William was named after his father and christened on the 16th of January 1774 at Newhills. He could therefore have been born at the end of 1773. Other than that, like his father, no more information is known about him. My great-great-grandfather James remembered his own grandfather when he named his eldest son William. Margaret was William’s only daughter, born in 1776 and christened on the 10th of November. She married John Henderson in 1802 in Newhills, and they moved to Chapel Of Garioch near Inverurie. This is about twenty miles north-west of Aberdeen. Jean Henderson was born on the 14th of November 1805 with Isobel born on the 29th of August 1807. Their third child, John, was born on the 22nd January 1810. These are birthdates, not christening dates. The latter were also recorded in parish records. A Christian Henderson was born in 1821 in Old Machar but probably to a different Margaret Hunter. John Hunter was born in 1780 and had a twin brother George. They were christened on the 24th of March. I haven’t been able to find any more information on John. George was John’s twin brother and the Scottish Censuses of the 19th Century give us a good insight into his life. He became a farmer of twenty-four acres and lived well into his eighties. The 18th of June, 1849, was a very special day in his long life. Now in his 70th year, he became a father. He had married Barbara Stephen, born in 1813, daughter of David and Janet Stephen from Skene, a farming community a few miles west of Aberdeen. She was thirty-three years younger than George. Whether he had previously been married or had children, I don’t know but his brother, Alexander had fathered twelve children by this time, so this was a momentous day for George and of course for Barbara. Their many nephews and nieces had a new cousin! Jessie Hunter had arrived and was duly christened on July 15th. The household included four servants/ farmworkers and two boarders, so congratulations and celebrations were in order. Now that he had a young daughter to help bring up, even a superman like George had to lighten his workload. So he and his family retired to Backhill Cottage, close by, to enjoy their new life. By the time Jesse was eleven, George was still going strong, and in his eighty-first year. He went on to reach eighty-seven before passing away on the 23rd of February,1868 at Crombie Cottage, Bishopford, Peterculter. Sadly Jessie died on 10th April 1868, just over a month after George. She was only eighteen. A terrible blow for poor Barbara. William Hunter's youngest child was Alexander, born in 1782 and christened on October 8. He was my great-great-great grandfather. He was a Stonemason which was a prominent industry in an area, famed for its blue granite stone. Aberdeen is known as the Granite City. Alexander met Christian Milne, also from Aberdeen, and they were married on the 23rd of June, 1810. Christina, the name she was known by, was nineteen years old and the eldest daughter of Andrew and Isabel Milne. A year later, Christian was born and christened on the 20th of March. She was to be the first of thirteen children born between 1811 and 1836. There seemed to be a preference for girls as only Andrew (1815) James (1819) (Alexander (1821) and Adam (1826) held up the blue banner. They also had a preference for the letter ‘A’ it would appear. The one son, not starting with A was to become my great-great-grandfather, James Hunter. In birth order, the girls were Christian (1811) Jane (1813) Isabel (1817) Margaret (1823) Agnes (1825) Helen (1827) Elizabeth (1830) Mary (1833) and Williamina (1836) It is interesting that Alexander didn't name any of his sons after his father William whereas both Christina's parents are represented. Alexander and Christina showed a meticulous sense of order and symmetry with births spaced every two years and only in odd years. Adam’s birth in 1826 broke the pattern at last. 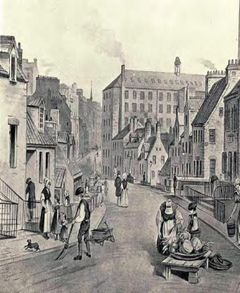 Many of the daughters went into the cotton industry as cotton reelers, and the family lived at the appropriately named Wyndy Wynd in Aberdeen West. Christina was still living at home in her forties with five of her sisters having moved on by the 1850s. Adam was the last of the sons to leave home, working as a hair cloth weaver. I don’t know when Alexander died, but it would have been between 1851 and 1861 because he is no longer with Christina for the 1861 census. The two grandchildren are particularly significant. Christina died in 1871 at the age of eighty-three. Before focusing on James Hunter and his lineage, we will look at what became of some of his brothers and sisters ... my great-great-grand uncles and aunts. After all, it took me so long to find them! She was christened on the 20th March 1811. As previously mentioned, she was still living with her parents in her fortieth year. Only Adam and two of her sisters, Helen and Mary, are with her. No further information is known. 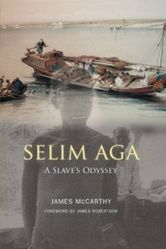 When James McCarthy published "Selim Aga: A Slave's Odyssey" in 2006, he didn't know the identity of the woman with whom Selim had a son. Since then, relatives of the boy have come forward, and the mystery lady was Jane Hunter. Jane's story is both intriguing and poignant. She was born in 1813 and christened on May Day. 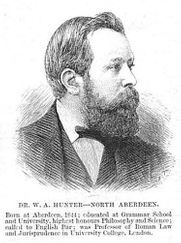 At the age of thirty-four, she gave birth to Alexander Hunter Aga on August 6th 1847 in Aberdeen. The father was Selim Aga born in The Sudan about 1826. 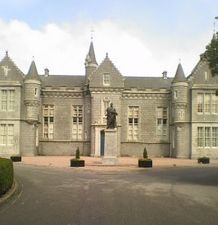 In 1836, he was brought to Peterculter, Aberdeen where he was raised by Robert's older brother John, born 21 June, 1780, and his wife Elizabeth, born 28 July, 1797, in opulent surroundings at Murtle House. John Thurburn and Elizabeth Finlater had married on 21 November, 1820 in Cairnie By Huntly. They had two daughters: Anna born on 26 May, 1824, and Barbara Anderson born on 22 May, 1826. Now they had a brother to play with. A very gifted young man with a thirst for learning and much creative expression. Elizabeth Thurburn sounds like a very special person indeed. She lived to be 75, passing away on Christmas Eve, 1872, and is buried at Peterculter Cemetery (see opposite) alongside her husband John, who passed away on 30 January, 1861. Neither would have known of the fate that would befall their protegee Selim in 1875. I don't know the extent of Selim's relationship with Jane or whether he knew of his son. He had left Peterculter by the time his son was born. By all accounts he was a young man of outstanding character and a devout christian with a clear vocation in life. 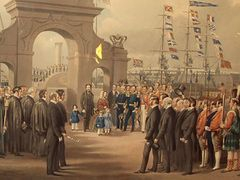 He spent the next few years in London, lecturing on the Panarama of the Nile at the the Great Exhibition of 1851, and was given an audience at the Foreign Office regarding his ideas concerning Africa. He joined the expedition of William Baikie on his second, ill-fated 1857 expedition up the Niger, and accompanied the famous African explorer Richard Burton on many expeditions to the west coast, particularly to the Cameroon Mountains and to the cataracts of the Congo, remaining with him till 1865. Selim spent the next nine years in Liberia where, serving as an assistant surgeon, he was captured during the Grebo War in 1875, and his head decapitated. He was allowed to read from his bible before his gruesome death. Like Jane Hunter, he died before he was fifty, but his life had been a full and remarkable one. Jane brought her son up in the St Nicholas area of Aberdeen. She was living with Alexander at 17, Young Street at the time of the 1861 Census. Shortly afterwards, on June 17th, she was found dead at home as a result of heart problems. Her brother James registered her death. Bless you Jane. 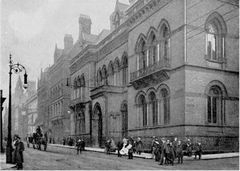 After Liverpool Museum opened in its new building on William Brown Street in October 1860, the first five African artefacts it acquired a month later were purchased from the African-born explorer Selim Aga. His collection of Nigerian travelling equipment. Aga acquired them in the interior of Nigeria on the voyage of the Dayspring - also pictured above. Fourteen-year-old Alexander had lost his mother, and his father was far away in Africa. He became a boot closer by trade and on the 28 September 1872, he married Mary Thomson Smith at St Nicholas, Aberdeen. Mary was born on October 9th, 1851 in Old Machar, Aberdeen, the daughter of William Smith, a tobacco pressman and Mary Barclay. Their one son, William, born in 1874, died a year later. Had he lived, he would have enjoyed the company of seven sisters! Mary Jane, born in 1873, lived to be eighty, and married Thomas Hill. Their daughter, Lily was born in 1908 and reached her seventy-ninth year. Alexander and Mary's second daughter, Janet McGregor Aga, was born in 1875. She emigrated to Illinois, USA, marrying James Fleming Crevie on July 9th, 1903. They had a daughter Jennette Mary, born on August 16th, 1908. Georgina was the third daughter of Alexander and Mary, born in 1877. She married John Skinner in 1904 and had two sons, John and William, and a daughter, Jessie. Georgina died in 1933. Her sister, Annie Bell Aga, was born in 1879, but died in 1882. Alexander and Mary's fifth daughter, Margaret Rae Aga, was born in 1881 and became a fancy box maker. She gave birth to William Rae Aga in 1899 in Glasgow. No details of the father are known, but in 1902, she married Duncan McPherson, also in Glasgow with Joan Palmer Aga McPherson born the same year. Margaret married William Heaney in 1935. She died in 1948. 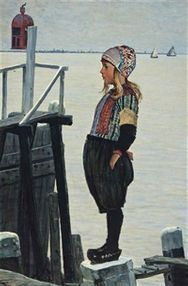 Johnann Palmer Aga was born in 1883. Her middle name Palmer was the married name of Agnes Hunter, her father's aunt, and her christian name is similar to the name of Agnes' daughter, Johanna. Alexander Aga was present at Agnes' death in 1890 and one presumes he felt close to Agnes, though he doesn't name any of his six daughters Agnes. Perhaps she had helped him following the death of his mother Jane. Johnann married Duncan McPherson's brother, Hugh, in 1905. Their daughter, Mary Palmer, was born the same year. Lily Reid Aga was Alexander and Mary's youngest daughter, born in 1884. She was forty-seven when she married Duncan Campbell in 1931. Alexander and Mary Aga were no longer living together by the the time of the 1891 Census. Mary was still in Aberdeen, but Alexander was in Glasgow. 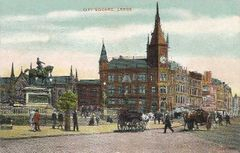 By 1901, Mary has moved to Glasgow with Margaret, Johnann and Lilly, but Alexander is lodging elsewhere in the city. She has reverted to her maiden name of Smith. Given the marriage break-up therefore, why would Mary move to Glasgow where Alexander has been living for several years? A mystery. Andrew was the eldest son of Alexander and Christian, named after his maternal grandfather (or the saint!) He was baptised on April 3rd 1815 at Saint Nicholas, Aberdeen. As yet, I have no further definite information about him. The 1841 English Census records two Andrew Hunters from Scotland of the right age. One living in london, and one in Manchester. She was christened on the 10th February in Aberdeen and was known as Isabella. She was named after her maternal grandmother. She became a dressmaker, and would appear to have remained single. The 1851 Census records her living at 150, Kingsland Place with her sister Williamina. By the 1861 Census, she is living with her mother again. Her father had passed away a few years earlier. Isabel died in 1874, three years after her mother. He was christened on the 28th November 1821. His parents had named one son after Saint Andrew, the next after King James, and now their third after the father. 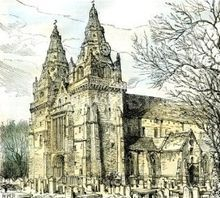 An Alexander Hunter married Catherine Ann Sim on September 1st 1848 at Saint Nicholas, Aberdeen. Otherwise, nothing more definite for Alexander. The 1841 English Census records an Alexander Hunter of Scotland, aged twenty, living in Liverpool. She was christened on September 14th, and possibly named after her father's only sister. 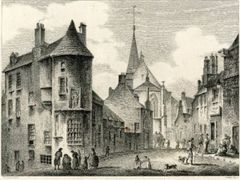 Her family lived in the Saint Nicholas area of Aberdeen, and there are two marriages recorded there for a Margaret Hunter. One married George Cameron on September 19th 1851. Another married William Bothwell on March 29th, 1850. She was christened on December 28th 1890 in Aberdeen. She became a hair cloth weaver, and moved from the family home before the 1851 Census. Her only child, Johanna Agnes was born in 1859, and christened at Saint Nicholas, Aberdeen on the 5th October. The father's identity is not known for certain, nor whether he married Agnes. What is known is that although Johanna was christened 'Hunter', she is recorded as Johanna Palmer in both the 1861 and 1871 Censuses. In the former, she is with Agnes in Christian Hunter's household as a grand-daughter. In the latter, she is recorded as the niece of Helen Gray, the married sister of Agnes. So what became of Johanna's father, the mysterious Mr Palmer? Johanna's marriage certificate of 1897 sheds more light on the matter. She gave her father's profession as hairdresser and that he was deceased. 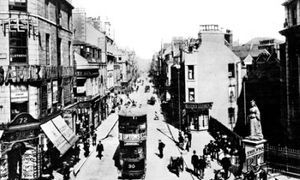 Agnes had passed away on June 26th 1890 at 8, Rennys Wynd, Aberdeen. She had died of bronchitis and heart disease. Her nephew Alexander Hunter Aga was present at her death. One wonders if his presence meant that he temporarily lived with her following the break-up of his marriage and before he moved to Glasgow. So Johanna's marriage to Gordon Wilson Mitchell on December 27th 1897 took place without the presence of either her mother or father. Gordon was an iron worker, born in 1855, the son of James Mitchell and Jane Davidson. It was a short-lived marriage because both Johanna and Gordon died three years later. 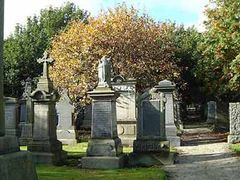 I don't know the full details but Johanna died at 75, Green, Aberdeen on April 14, 1901, and Gordon died on December 28th 1901 at the Royal Lunatic Asylum, Aberdeen. Johanna was only forty-one and Gordon just forty-six. They had waited longer than most before they had got married, and then fate had struck them the cruelest of blows. Unlike his siblings, there is no christening date or similar record of his birth. We only know of his existence by way of the 1851 Census where his age is given as twenty-five and his occupation as a hair cloth weaver like his sister Agnes. The only other record of an Adam Hunter is for a burial in Old Machar Churchyard on January 5th 1853. This most likely is our Adam Hunter. 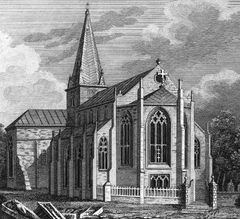 Helen was christened on November 8th 1827 at Saint Nicholas, Aberdeen. She became a cotton reeler and is at home for both the 1851 and 1861 census. 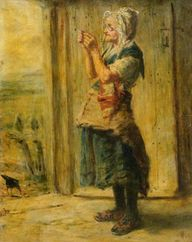 In the latter, she is described as a cloth loom weaver. She married James Gray of Perthshire on October 19th, 1861 in Old Machar, Aberdeen. 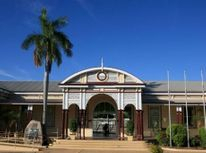 They moved to Perth where James Hunter Gray was born early in 1863. 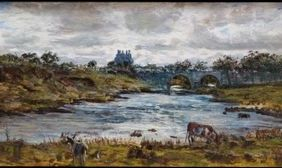 William Steel Gray followed early in 1865 in Blairgowrie, which is twenty miles from Perth. When her husband died in 1867, Helen moved back to Aberdeen, and Agnes and Johanna lived with her for a time. 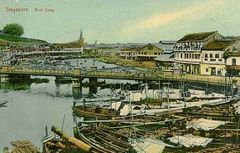 Her two sons emigrated to the USA during the 1880s. She was christened on February 5th, 1830 at Saint Nicholas, Aberdeen. I have nothing concrete for her after that but the Elizabeth Hunter who married Alexander McDonald on July 16th 1858 at Saint Nicholas looks to be our Elizabeth. There are no alternatives within a twenty year range ... assuming that Elizabeth both lived to adulthood and indeed married! The known children of this marriage are: John born in 1859; Elizabeth born in 1862; and Alexander born in 1869. Mary was christened on September 27th 1833 at Saint Nicholas. The 1851 Census showed her to be a cotton reeler like several of her sisters. She married John Hillyard, son of Richard Hillyard and Mary Hancock, on June 15th 1861 at Old Machar. John was born in 1825 in Miserdon in Gloucestershire, a beautiful Cotswold village. North-East Scotland was a very different landscape. He was a private in the 78th Regiment of Foot, which was a Highland regiment. He was also a groom and a granite polisher. 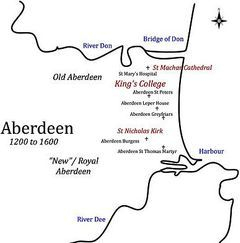 Mary and John had seven children who were all born and christened in the Saint Nicholas area of Aberdeen, but only four lived to adulthood. Christina was born in 1861, named after Mary's mother, but she died five years later. James Henderson Hillyard was born on June 26, 1863, and emigrated to the USA in 1887 aboard the Umbria, settling in Barre,Vermont. In 1906, he married a fifty-year-old widow. He died just before World War Two, and with no children of his own, left his estate to his younger brother William. Solicitors advertised in Aberdeen newspapers for William. However as war broke out, he was unable to go to America and claim his inheritance. It subsequently went to James' landlady. Margaret Jane was born on December 22,1865. 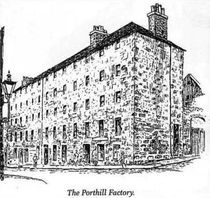 She was a cotton weaver, and married fellow Aberdonian Peter Mitchell, two years her senior, on April 11th, 1889 at Gallowgate, Glasgow. However, they lived in Aberdeen where their seven children were all born. Thomas, Jemima, Mary, William, Helen and the gloriously named Hind John Foxcroft Mitchell. There was, of course, a Williamina Mitchell, born about 1896. Margaret died on April 29th 1911, just forty-six years old. On Jan 21, 1868, Mary and John Hillyard again named a daughter Christina, but she died the same year. In 1869, John William was born on May 28, but he died the following year. 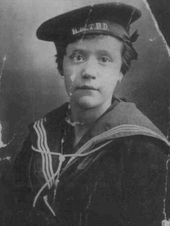 Williamina was their sixth child, born on 6 March, 1871, named after her mother's younger sister, although Williamina was a popular name in Scotland at that time. In 1891, she married Adam Emslie in Dundee. Adam was also from Saint Nicholas, Aberdeen, born on the 16th of April 1870. He was the son of John Emslie and Isabella Rust who had married on New Years Eve, 1869. His younger brother John had the rather quaint middle name of Florence. Adam and Williamina's only child, Adam, was born in 1895. 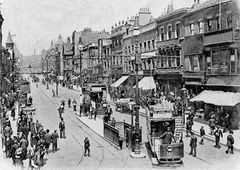 By 1901, Adam is boarding elsewhere in Aberdeen, and Williamina has met Henry Street of Devonport, born in 1868, and moved to Manchester. Henrietta, Williamina, Walter, James, Louisa, and Albert were all born there between 1900 and 1912. Henry Street died in 1825, and Williamina, like her aunt before her, decided to cross the seas in 1927. In her case it was not the USA but Australia where her children married and started new lives. William (lower left) was Mary and John's seventh child, born on May 21, 1873. He was a builder and stone cutter by trade. He married Barbara Gordon on October 9th, 1895. She was born in 1877 in Aberdeen, the daughter of Archibald Gordon and Barbara Williamson. William and Barbara's first child, William, was born in 1899. He married Grace Glenn circa 1923. Charles Sutherland Hillyard was born in 1901. He became a builder, and married Margaret Walker on May 5th, 1823. William and Barbara's first daughter, Lillie Gordon Hillyard (above right) was born in 1904 in Manchester where William had moved following his mother's death in 1903. Perhaps his sister, Williamina, had recommended Manchester. Lillie went on to marry Norman Cecil Anderson, a saw miller, in 1925. They had four children, Norma Cecilia, Alexander, Dorothy, and William. She died in Aberdeen in 1960. William and Barbara returned to Aberdeen where Maggie Reid Hillyard was born in 1906. Barbara died on Nov 5th 1954 in Aberdeen, and William died the following year. I discovered Lillie's details through contact from her grand-daughter who now lives in Australia. Her family register notes have greatly helped fill in some of the gaps in my knowledge of the family, and the above photographs were sent by her. On January 4th, 1892, John Hillyard died in Aberdeen, aged sixty-seven. The 1901 Census shows Mary, now sixty-eight, living at 85, Wales Street, Aberdeen with William and Barbara. She also has the company of her one-year-old grandson William and newly-born Charles (see his Golden Wedding photo with Margaret opposite) Barbara's younger sister, Helen, is also at Wales Street. A very special time for Mary. She died on December 20th, 1903, months before her grand-daughter Lillie's birth in Manchester. She was Alexander and Christina's youngest daughter, born in the summer of 1836, twenty-five years after their first child. On her death certificate, her father's name is given as William rather than Alexander. Given her christian name, one wonders if she was an adopted child of Alexander and Christina. The latter was in her forty-fifth year now. Williamina does go on to name her first son William, giving further credence to the adoption possibility. Alexander's father was William, so it could just be a case of a grand-daughter remembering her grandfather, and the death certificate entry an error. Either way, Williamina was christened on July 6th 1836 at Saint Nicholas and was to lead a very interesting life. She certainly lived up to the ' Will ' part of her name. 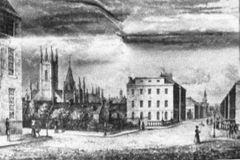 She was not at home for the 1851 census but living at 150, Kingsland Place with her unmarried sister Isabella. Williamina gave birth to Isabella Sinclair Hunter on October 10th 1858. Her maternal grandmother was called Isabel, but I think it was the closeness she felt to her sister that made her choose Isabella. The father is unknown but his name was probably Sinclair given this name didn't previously appear in the family. It was common practice in Scotland, to use surnames as middle names. Often the mother's maiden name. Isabella almost certainly died at an early age because she is absent from Williamina's life thereafter. 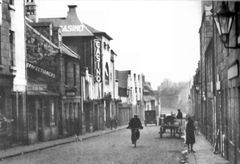 She gave birth to a son on January 16th 1861 at West North Street, Aberdeen, and registered him as William Hunter on February 5th. However, he became known as William Duncan thereafter, following court proceedings. He was at his grandmother Christina's home for the 1861 census with Williamina, now a powerloom weaver. Nothing is known of William's father other than his surname. Similarly with Williamina's third child, Alexander Aga Hunter, born on October 22nd, 1864, at Farquhars Court 17, Upper Kirkgate, Aberdeen, and registered on November 11th. His father is also unknown but Williamina's choice of middle name is interesting, re-inforcing that she was a young lady of very strong character, befitting one born in the year of the Fire Monkey. Self-assurance, determination, and willpower are just a few of the many positive qualities she would certainly have had. Williamina was the most independant of women who gave each of her children her own surname of Hunter, disregarding their fathers' surnames. She would have admired her sister Jane's courage in bringing up her son Alexander Hunter Aga, and clearly saw her as a role model. Jane had died a few months after the birth of Williamina's first son, and with the birth of her second son, here was a chance for her to honour Jane's memory. At the same time, of course, she was showing her support for her nephew. 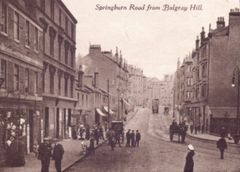 The 1871 Census finds Williamina living at 109 Springburn Rd, Maryhill, Glasgow with her husband William Couper, aged fifty-three, a retired shoemaker from Peterhead. She's enjoying a slight change of christian name too ... Wilhelmina Couper. No-one has been able to trace a marriage between them ... probably because there wasn't one. William Hunter/Duncan is now William Couper, and his younger brother Alexander Aga Hunter is now Alexander Couper. Both are recorded as sons of William Couper. I suspect that Alexander is now with his natural father because when he later marries, he gives William Couper as his father, deceased. He could, of course, have meant step-father. He also named his first son William. William, presumably, died sometime in the 1870s because in 1879, there is finally a marriage record for Williamina! At the age of forty-two, she broke the habit of a lifetime and married forty-five year old Alexander Crockert in Glasgow. He was also from Aberdeen and an iron moulder by trade. 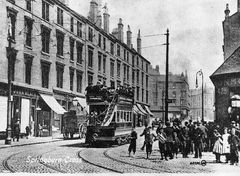 The 1881 Census, finds them living at 97, Parliamentary Rd, Baronry, Glasgow with Alexander, now sixteen, and an engine fitter apprentice. Alexander's own sons, James, eleven, and Robert, eight, are also members of the household. William is lodging elsewhere in the city. Wilhelmina is now a dressmaker, following in the footsteps of her now deceased sister, Isabella. Sadly, her marriage was to be a short one, with Alexander dying in his late forties. Wilhelmina, now living at 48 Cowlairs Road, was just not destined for marriage. However, on July 17th, 1885, there was a very special moment in Wilhelmina's colourful life. Alexander decided that twenty-one-year-old Janet Marshall of 16, Gilmour Street, Glasgow was the girl of his dreams. She was the daughter of John Marshall, a grocer, and Agnes Smith who were both deceased. This left Wilhelmina, as we must now call her, the only parent at the wedding ceremony. Her son William was one of the two witnesses, the other being Elizabeth Cameron. The following year, William went one step further ... he became the groom himself. A second joyous occasion for Williamina who was now a staunch supporter of the marital state. He married Mary Armstrong from Ireland, born five months after himself in June, 1861. It had been over twenty-five years since Wilhelmina had lost her only daughter Isabella. Now, at the age of fifty, Williamina suddenly had two daughters in the space of twelve months. The same year, 1886, Alexander presented her with her first grandchild, William, born in Glasgow. Not to be outdone, William presented her with her second grandchild, William, in November 1887. She was surrounded by Williams! Needless to say, she would eventually meet two little Wilhelminas too ... but only one of them in Scotland. With the birth of her first grand-daughter, Agnes, soon after, Wilhelmina's ship had certainly come home. Agnes was their first American citizen with several more following before and after the turn of the century. On April 13th 1897, Wilhelmina, William, Mary, and their four sons, William, born Nov 1887, Maxwell, Nov 1891, Alexander, March 1893, and Samuel, Jan 1896, arrived in Glasgow on board The State of California. Their stay was long enough for Wilhelmina Couper to be born in June 1898. The fresh Scottish air had given William and Mary their first daughter! Now each of Wilhelmina's sons had blessed her with a mini Wilhelmina ... the first one having been born in Milwaukie in 1893. When they returned to the States, it wasn't to Philadelphia but to Milwaukie, Wisconsin. 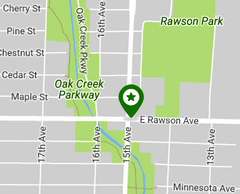 The 1900 US Census recorded them living at 17th Avenue, South Milwaukee City with one addition to their five children, little Isabel, born in January 1900. William was now a boilermaker by trade. Wilhelmina was not living with them, nor had she stayed in Scotland. She had returned to 402 Allegheny Ave, Philadelphia to be with Alexander and Janett. The 1910 Census records that Alexander is now a machibist at a mill, and his eldest son William is a hosiery designer. William goes on to serve in World War One. Agnes is a hosiery knitter, and fifteen year old James is a plumber. John, 14, Elizabeth 12, Alexander, 10, Mary 5, and Charlie, 5 months complete the family. Their surname is recorded as Cooper not Couper. There are two notable ommisions. Wilhelmina, who might be staying elsewhere on the night of the census, and her grandmother Wilhelmina. The latter was missing from the census with good reason. On April 25th 1909, at the age of seventy-two, Wilhelmina Couper had passed away in Philadelphia. She was buried four days later. Her death certificate listed her occupation as housekeeper. I found a second entry for her under Tennessie Deaths and burials where she is called Minnie Couper, and her birth year corrected from 'about 1837' to 1836. This is an update of the Pennsylvania records which ceased in 1915. Last but by no means least, we come to Alexander and Christina's fifth child, James Hunter, born in 1819, and christened on July the 23rd. He and Margaret Boddie are very special people to me because for so long, I only knew of my great-grandfather, Alexander Boddie Hunter. To finally trace his parents and lineage, was one of the great moments in my family history research. So I welcome my great-great-grandparents, James and Margaret with very open arms! And their two wonderful portraits above. James' elder brother bore the Saint's name, so James bore the King's name. James Hunter worked in the stone industry, like his father Alexander, becoming a manufacturer of polished granite. He was one of the first to leave home, marrying Margaret Boddie on the 13th of July, 1843 in Old Machar. Margaret was the eldest of seven children born to John and Margaret Boddie. John was a millwright from Kenmay and Margaret from Chapel of Garioch, Aberdeenshire. Margaret had been brought up at Fetternear Farm, daughter of James Yule a carter. Their children were brought up in the Saint Nicholas part of the city. See separate section on the Boddies. 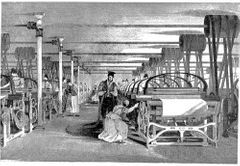 When she met James, Margaret was a cotton reeler like many of his sisters. They were to have six children, including a distinguished politician and a renowned artist--plus my great grandfather, Alexander. The 1871 census recorded James as an employer of forty-seven men and seven boys in his business. This was quite an expansion from his 1861 employment of eight men and four boys when they lived in Old Machar. Now they were back in Saint Nicholas, living in Kings Crescent. The 1881 census finds them living at 209, King Street, Saint Nicholas. When you bear the name of James, you have to live in a king's street or crescent. James describes himself as a general merchant, and he is also a magistrate. Only Christina, now twenty-three, and George Sherwood Hunter are living with their parents now. George is an artist in oil figures. My great-grandfather, Alexander Boddie Hunter, was now in Leeds, employing forty-seven workers of his own and naming his second son Sherwood Hunter, after his brother. I have yet to discover the Sherwood connection in the family. James, and his sons were the most enterprising of men. The 1891 Census records James as retired, and in Battersea, London with Christina. William and Christina are with them, both unmarried. Two years later, Christina did marry at last. Sadly, however, James and Margaret were to outlive their son William, because in 1898, William died, aged just fifty-four. To outlive his son was a painful enough experience for James, but the following year, fate dealt him another blow with the death of Margaret. They had shared fifty-five years together and seen the Victorian Age shape a nation. Margaret passed away on the 12th of December 1899 in Woodside, Aberdeen. James died in 1910, at the age of ninety-one. William Alexander Hunter was the first born on the 8th of May, 1844, named after James’ grandfather William and his father Alexander. 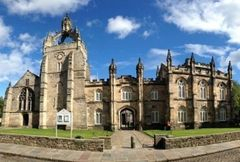 He was educated at Aberdeen Grammar School and entered Aberdeen University when aged just sixteen. Rather than taking to Aberdeen’s many industrial occupations, he went on to become a barrister. He worked at Middle Temple and Brick Court Temple in London, and was called to the Bar in 1867. 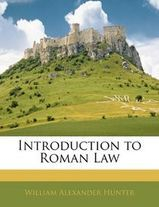 Two years later, he was appointed professor of Roman Law at University College, London, and in 1878, professor of Jurisprudence. 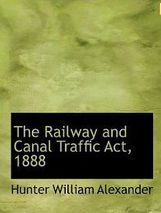 'The Railway And Canal Traffic Act, 1888'. 'The Trial of Muluk Chand for the Murder of His Own Child A Romance of Criminal Administration in Bengal', 1888, co-authored by William Hunter, Muluk Chand, and Manomohan Ghose. 'The financial relations of England and Scotland', 1892 was his final publication. All or most of his works can be bought at Amazon.com or similar, and some can be previewed as e-books. He also contributed to 'John Stuart Mill; His Life and Works', published in 1873, writing the last essay, 'His Position as a Philosopher'. William was a Liberal in his thinking, so who better to write about. "What Locke was to the liberal movements of the seventeenth century, Mr. Mill has more than been to the liberal movement of the nineteenth century" wrote William. He ends his essay: "and we may hope and believe the working-class will rise to such a standard of wealth and culture and political power as to realize the generous aspirations of one of England's greatest sons." This article can be read online http://www.gutenberg.org/catalog/world/readfile?fk_files=1499217. From 1882, he devoted his life to politics. He became the first MP for Aberdeen when he was elected the Liberal MP for Aberdeen North in December 1885, winning 4,794 of the 5,865 votes. His party, led by Gladstone, didn't have an overall majority, and an election followed in 1886. This time, Lord Salisbury's Conservatives were returned to power. So for the next six years, William's party was in Opposition. He served with distinction and integrity until April 24th, 1896 when failing health caught up with him, and he resigned his seat. 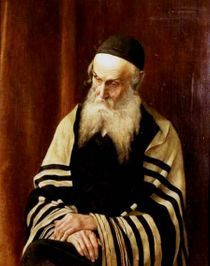 It had been nearly two years since his last recorded contribution in the House, on July 26th, 1894, indicating the severity of his decline. His 661 speeches and questions in the house from 1886 to 1894 can be found at http://hansard.millbanksystems.com/people/mr-william-hunter. An extraordinary resource! An example of William at question time: "I beg to ask the Under Secretary of State for Foreign Affairs whether a Bill has passed the French Chamber of Deputies introducing universal and compulsory insurance of workmen against accidents; and whether he could obtain a copy of the Bill?" He was the first MP to advocate old age pensions, and in 1890, he carried a proposal for free elementary education in Scotland. His work was his life rather than marriage, and he remained single. The 1891 census, showed his parents, now retired, living with him in Battersea, London together with Christina. As an active member of the House of Commons, William needed to be within easy reach of Parliament. In due course, he moved back to Scotland where on the 21st of July 1898, he died, aged just fifty-four in Cults, near Aberdeen. His newspaper obituaries were testimony to the esteem in which he was held. His brothers James and Alexander, and his sister Margaret, each named a son William Alexander. A truly great person of his times, and greatly missed. The next son of James Hunter was also to achieve greatness, but in a very different field. George Sherwood Hunter was their second child born, in 1846, christened on the 30th of May 1846. This was the year of the Fire Horse which occurs every sixty years. Those born in such a year often possess remarkable qualities and potential. George would seem to have harnessed the power and channelled it into his art. The censuses of 1871 and 1881 record him as an artist painter and a painter of oil figures. 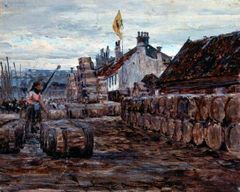 The landscape of Aberdeenshire and its variety of industries would have given him excellent subject matter with the North Sea coastline inspiring him further. “… he is a new man and none of the critics dare to praise him … he has struck out a distinct and original line of his own. We have too many copyists and many imitators … to pass over any sign of originality we may come across.” He travelled widely both in England and the continent. The previous year, 1889, he had married Constance Mary Suart at Lancaster Gate Christ Church on the 23rd of April. Both were into their middle forties but were to share their lives for the next 30 years. Constance came from a very interesting family which merits some space here of its own. Constance was a year younger than George Sherwood, the daughter of Edward Montague Suart and Catherine Mary Harriet Schneider. Edward was born in Liverpool on March 2nd 1813, the eldest son of Edward Suart and Emma Hodgson. They had married on August 28th, 1811 in Chigwell which was Emma's home. Edward senior was from Lancaster. Their second son was William Swainson Suart, born on July 30, 1814, also in Liverpool. 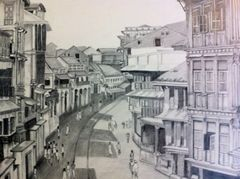 His life is well documented as an engineer in the East India Company, first in Bombay and then Aden. After serving twenty one years, Major Suart retired to Chigwell where he became a leading figure in the community, becoming both a judge and churchwarden. He died in 1882, as a result of "overwork from his multifarious duties." He lived at 'The Bower', Chigwell Row with his wife Elizabeth Murray Suart, their four children and six servants. 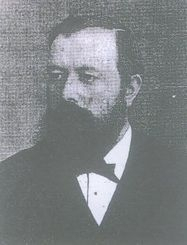 Alfred Suart was Edward and Emma's third son, born in 1819 in Chigwell, where presumably his parents had moved to from Lancashire. His first wife Rosamund died in 1872, leaving him with one daughter, Emma. He married Louise Brady in 1875, and settled in her home town of Tunbridge Wells. He died there in 1882, the same year as his brother William. Returning to Constance's father, Edward. He too served with the East India Company. On January 1st 1841, Elizabeth was born in Sholapur, Maharashtra, India. I don't know the mother's name, but four years later on the 6th August, in Chigwell, Edward married twenty-four year old Italian-born Catherine Schneider. 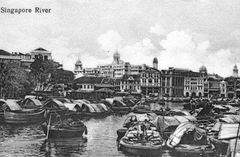 Two years later, Constance was born in Bombay. Her sister Josbie was born on the 23rd March 1852 in Mulligaun, Maharashtra. 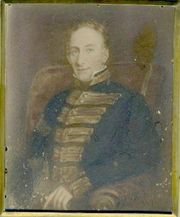 Edward died on the 7th April 1854 in Khundash, Bombay, aged only forty-two. The mystery of his first child Elizabeth and her mother remains. There is no further information of Josbie either. Perhaps both Constance's sisters died in India or stayed there to live. The 1881 census shows Constance and her mother living in Broadwater. Catherine survived Edward by thirty-four years, dying on August 15, 1888 in Paddington. She missed her daughter Constance's marriage to George Sherwood Hunter by eight months. George Sherwood Hunter's mother-in-law, Catherine Schneider, was the eldest child of John William and Caroline Schneider. They had married on April 1st 1820 in Chigwell, London where Caroline was from. She was born in 1798, the third daughter of John Wilkins. John Schneider's work took him to Cremone in Italy where Catherine was born in 1821. 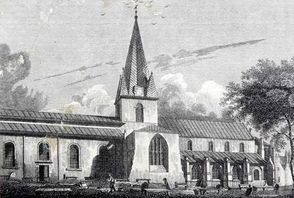 John William followed in 1824 and Frederick in 1825. Their whereabouts thereafter are not known, but they would be somewhere in India. They are back in Chigwell during 1838, but they are absent from the 1841 and 1851 censuses. There seems to be a 4th child born to John William and Caroline who was hitherto unknown to me. Martin at https://mprobb.wordpress.com/category/aislabie/ has a most interesting website, Past Lives - rescuing my ancestors from obscurity, and "What’s in a name? Tracing the origins of Isabella Schneider Gibson" led me to Isabella Schneider. As he says "None of the accounts of the Schneider family that I’ve come across mentions Isabella ...When Edward made his will in 1855, he described Isabella Gibson as his sister-in-law, thus confirming that she was another of the daughters of John William and Caroline Schneider." I found Isabella's marriage to Thomas Wheatley Gibson on Dec 7, 1847, and it being in Chigwell confirms Isabella as indeed being one of John and Caroline's children. The 1861 Census tells us that she was born in 1823. Two good confirmations of Isabella being the 2nd of the 4 children ... and therefore an aunt to our Constance, and ... George Sherwood Hunter is her nephew-in-law! Welcome to our family Isabella. The 4 children all had Indian connections. Isabella's husband Thomas was an officer in the British Army there. Catherine lived there with her husband Edward Suart, and Constance Suart was born there. Frederick Schneider married twenty-one-year old Louisa Fuller in Bombay on December 5th 1853 with their children William Montague and Caroline Constance born there. Louisa died soon afterwards and Frederick, a Colonel in the Bombay Army married Ruth from Nova Scotia. John William Schneider married seventeen-year old Amelia Euphemia Davidson on March 10th 1951 in Bombay with Claude Vyvian and Stewart Melwill adding to Constance Suart's list of cousins. John Schneider died in 1853 in London - a year before his son-in-law Edward Suart, and Caroline moved to Somerset. Catherine Suart had lost her husband and her father in the space of a year, and neither very old. Seven-year-old Constance had lost a father and a grandfather. John Schneider's family background is interesting. The Schneiders were merchants who came to England from Switzerland in the 1700s and had contracts with the Mexican Government for silver coinage. John was the eldest of seven children born to John Henry Powell Schneider and Ann Catherine Penelope Congreve who had married in Charlton, London on the 21st March, 1797--the first day of Spring! Ann, born November 8th, 1773, was the eldest daughter of Colonel Congreve of the Royal Artillery and first cousin to John Henry. They set up home in Edmonton where John William was born in 1798. Following the birth of their seventh child, Harriet on April 6th, 1814, Ann died, and John Henry married Elizabeth Moul on August 1st, 1816. Six days after the birth of their fourth child, Robert, Elizabeth died on Dec 8th 1822, and Robert died four days later. Poor John Henry had lost Ann, aged forty and now Elizabeth, aged thirty-eight. Forty-four-year old Emma Darling Goad became his third wife on January 20th, 1824. They lived at Beaver Hall, Edmonton. Unfortunately, Emma died in the summer of 1841 and once again, John Henry, now seventy-three, was a widower. He died in Brighton ten years later. His son Henry William Schneider, born on May 12th 1817, was so successful as a businessman that there is a statue of him in Schneider Square, Barrow-in-Furness where he lived and worked in Steel production. An illustrious great-uncle for Constance Suart to go with her equally illustrious husband, George Sherwood Hunter, to whom we must finally return! 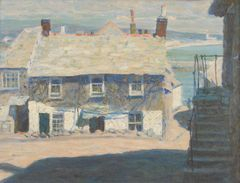 Having exhibited regularly at The Royal Academy of Art and The Royal Society of British Artists, George, now fifty-six, moved to Newlyn,Cornwall in 1902. Here the famous Newlyn School was already flourishing. It was a Post Impressionist school of painting which attracted artists worlwide owing to the quality of light and the low cost of living. 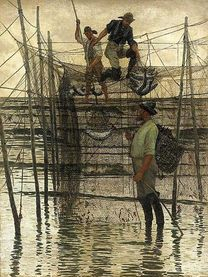 George and Constance soon settled into the artistic community, and George taught at Stanhope and Elizabeth Forbes Art School. 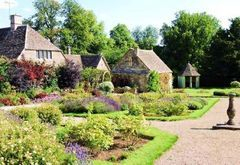 He lived at the Malt House and had a studio in Bateman’s Meadow, below the grounds of Orchard Cottage. This was also where Stanhope Forbes had his classrooms. George had found his place in the sun and lived at The Malthouse until his death on the 18th of June 1919. Rather poignantly, his beloved Constance died on the 29th of November that same year. Together in life as together in death. 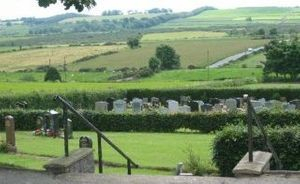 Their joint tombstone at Sancreed Parish Church Graveyard is pictured below. 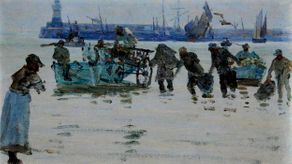 During his lifetime, George Sherwood Hunter exhibited a great many works, including sixteen in the Royal Academy and over sixty at the Royal College of British Artists. Having no children of his own, his share in the meadow studios was left to his two sisters in Aberdeen, Christina and Margaret. The Malt House, orchard and cottage were left to Hunter’s nephew, Sherwood. Having named their first child after James’ grandfather and their second after his uncle, it was time to name a son after James himself. This he duly did with the birth of their third son on December 18th, 1848. James returned this honour by going into the family business as a stonecutter. Three sons and all so different in their vocations. James married Isabella Connon (pictured above) on the 17th August 1875. Isabella was the eldest daughter of George and Jane Connon. 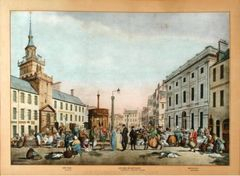 George, a commercial traveller of wines and spirits, was from Old Deer in Aberdeen and had married nineteen year old Jane Rhind from Saint Nicholas in 1848. They had one other child, Jemima born in 1850. The Connons and Rhinds tended to have much smaller families than the Hunters and the Boddies. James and Isabella took the Connon/Rhind route and had just three children, James,George and William, very much traditional Hunter names. With both William Alexander and George Sherwood Hunter being childless, their parents James and Margaret at last had grandchildren.Whereas his brothers travelled alot in their lives, James stayed in Aberdeen and it is his address at 45, Stanley Street that will long stay in my memory. It was there that the 1901 Scotland Census found his nephew Stringer staying which opened the Hunter genealogical door for me. Two years earlier, Stringer's elder brother William Alexander had also stayed there. James had named his own third son William Alexander. Both were to die as a result of World War One. James and Isabella ran a very accomodating household because as well as their nephews staying, Isabella's parents George and Jane Connan also lived there. So a busy environment for James, George and William to grow up in.The picture below, taken in 1938, shows their eldest son, James with his family. James was their first, born in 1876. He went into the medical profession and married 27 year old Margaret Macbean on 9th April 1915.They had six children. 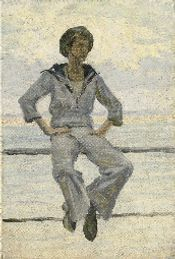 Hamish was born in 1916 and died during the war in 1941. Gillies was born in 1918 and married Mary Martin. William was born in 1921 and married Margaret Armstrong,with two children born in the '50s. Margaret was born in 1923, marrying Arthur Cheetham. They had two sons. Jean was Margaret's twin sister and married William Johnstone, eight years her senior. They also had two sons. Alexander was James and Margaret's last child, born in 1925. He married Pamela Morton and they had a son and a daughter in the '60s. James Hunter died in 1944, aged sixty eight and Margaret in 1982. Gillies passed down a copy of his family tree to his brother William's son Ian. I received this tree from Ian and it led me to at last discovering my Great Uncle William Hunter's date of birth and marriage details. This tree also has many photos of my ancestral Hunters. George Connan Hunter was James and Isabella's second child, born in 1878 and became an accountant. He married Beatrice Tannahill at Holy Innocents Church in Norwood on the 30th June 1913. They took the Connan/Rhind approach and had three children. Ian born in 1914 married Joy Wallace, born in 1928, and they had three sons in the 1950s.It is one of Ian's daughter-in-laws, Ann, who has helped me so much with this family tree and this website owes much to Ann. Angus was George and Beatrice's second child, born in 1916. Sadly,he was a casualty of the war in 1941. Their last child was Colin born in 1918 and who died recently on December 30, 2009. Beatrice died in 1966 and George two years later. William Alexander Hunter, named after James' eldest brother,was born in 1885 and became an architect. He died on active service just before the war ended in October 1918. His cousin, also William Hunter ( my great-uncle ) died in the war too. James and Isabella both died in 1932. Like George Sherwood and his wife Constance, James and Isabella left the world together. James and Margaret’s first daughter finally arrived on the 18th of October 1851 in Aberdeen and was named after her mother. Her maternal grandmother and great-grandmother were also called Margaret. 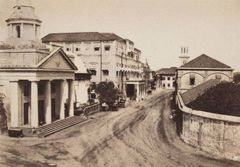 On the 12th of November 1872, at the delightfully named Canal Road Villa, she married William Thomson, an ironfounder. Two years later, they had their first child, a girl, who was duly named Margaret. She therefore became James and Margaret’s first grandchild. Cressie Hunter, Isabella Connan, James Hunter, William Alexander Henderson, and Peter George followed in due course. Margaret therefore had a sense of paternal Hunter tradition as well as maternal Margaret tradition. She died in 1933. Their second daughter, Christina, born on October 4th, 1856. Interestingly her place of birth was Hutchesontown in Glasgow and not Aberdeen. She was still living with her parents in Saint Nicholas and later during their time in London with William. 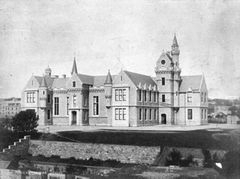 She met and married William Sutherland on the 30th August 1893 at Westbourne house 438 Union Street Aberdeen. At the age of thirty-seven, she had her only daughter, Christina on the 19th September 1894. At the age of forty, she had her only son, Charles Mchardy Hunter, on November 2nd, 1897 at 26,Osborne Place. Both Christina and her sister Margaret were left paintings in the will of their brother George Sherwood Hunter. James and Margaret’s youngest son, Alexander Boddie, was to provide them with the most grandchildren, six, matching their own family size--and not a granddaughter in sight. 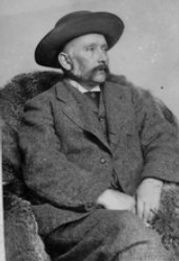 Alexander Boddie was born on August 4, 1854 in Mocsary, Inverary, Argyllshire. With Christina born in Glasgow, three years later, it would be interesting to know the family’s movements during the 1850s. It does suggest that during this period they had moved away from Aberdeen, but I can’t confirm for how long or why. Alexander, was my great-grandfather and he started work as a stonecutter in the family business. However he was to became a real entrepreneur during his life, and like his brother William, he moved down south to England. He settled in West Yorkshire where he became the head foreman at Poppletons Wool Mill. He met and married Sarah Elizabeth Race of Horbury, Wakefield early in 1878. Their first child, Race Hunter, was born later that year in Horbury, and given his mother’s maiden name as his christian name. Sarah was born in 1856, the daughter of Thomas and Martha Race. 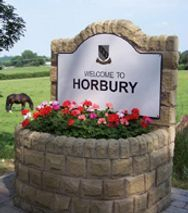 Races had lived in Horbury for centuries. Thomas was a farmer of one hundred acres and lived at Northfield House. Sarah had one brother, William Thomas Race, born in 1849. Alot more of him and other Races in their own section. Alexander and Sarah moved to 6, Abysinnia Grove, Leeds. In the Spring of 1880, Sherwood Hunter was born, named after Alexander’s brother George Sherwood, the artist. 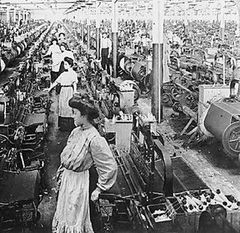 Alexander was now a woollen manufacturer, employing 32 women, 8 men and 7 girls, according to the census of 1881. The local Gazette published this notice on April 17th 1883: "NOTICE is hereby given, that the Partnership which has for some time past been carried on by Edwin Holt and Alexander Boddie Hunter, under the firm of Holt and. Hunter, at the Bean Ing Mills, Leeds, in the county of York, in the trade or business of Woollen Manufacturers, was dissolved, pursuant to notice inaccordance with the articles of partnership on the 9th day of February, 1883.-Dated this 12th day of April, 1883. 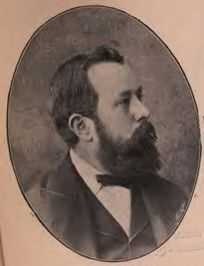 Edwin Holt. A. B. Hunter. Incidentally, Sarah Hunter's maternal grandmother was a Holt. Their third child arrived on April 14th 1882. The esteem that Alexander held for his eldest brother, William Alexander, was reflected in his choice of names for his new son, William Alexander Hunter. These were also names very much in the Hunter family tradition. Stringer Hunter was born on the 3rd April 1884 in Leeds. Sarah’s father was living in Stringer Lane about the time of her birth and their next-door neighbour was a John Stringer and family. However his christian name is actually the maiden name of Sarah’s mother, Martha Stringer. Alexander moved his family to Manheim on the Rhine in Germany some time in the late 80s, where he worked as an engineer. 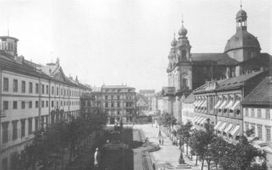 Family recollections by my uncle Alastair are my source for it being Manheim, but with George born in Worms in 1888 and William Hunter going to primary school in Worms, it may well have been that ancient city to which they moved. Either way, the two cities are very near to each other. It was here that their fifth child was born in 1888. His name George Suart Hunter must have brought a smile to the face of Alexander's brother George Sherwood Hunter. Their last child was born on the 6th September, 1890. They entered into the spirit of the country they were in and named him Franz Rudolf Hunter. Their sons were all bilingual and were educated in German schools and universities in due course as well as in English ones. 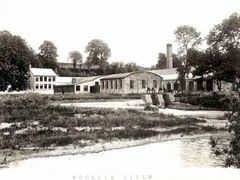 From 1908 to 1911, Alexander was the manager of Kilkenny Woollen Mills in Ireland. I owe this, and other recent information to Niall Brannigan who for sixteen years has documented some three thousand men and women from County Kilkenny who served in the Armed Forces during World War One. The Irish Census of 1911 of April 4th lists Sarah as living at 41 Greens Hill, Kilkenny City with her son George Suart - misread as Lovet n the typed form. He is described as a "22 year old native of Germany and student of textiles at Leeds University." They have one stable and one chicken house. It tells us that Sarah has had 7 children but just 6 are living (Irish Census forms do have great details! ) Alexander is aboard the Dublin-based coasting trade steamer SS Lady Wolseley, docked at Millbay, Plymouth at the time. 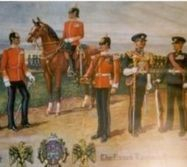 Alexander was to see three of his sons die as a result of the First World War. Particularly heart-breaking must have been identifying Race's body, found in the sea off the Essex coast in June 1916, following Race's internment in Germany. He personally saw that Race's effects, including the sum of £113. 1s.8d, were sent to his widow Olga. His wife Sarah died in 1919. They were living at 195, Hyde Park Road at the time. That year also saw his brother George Sherwood Hunter and his sister-in-law Constance pass away. Sarah was only sixty-three, but she lived long enough to see two granddaughters. Franz’s Constance in 1915 and Race’s daughter Rita a little earlier. Alexander returned to Germany in 1919 to bring Rita to England where she was raised by Sherwood and Gertrude. He was witness at Franz’s marriage to Ione in 1922 and lived long enough to meet their two children, Alastair and Ina. It's interesting to note that the Commonwealth War Graves Commission cited George's family as living at Church Farm, Hopton. This suggests that Alexander lived there before Franz and Ione moved there. Or, perhaps, he lived with them for a short time after their marriage. Either way, he was back in Leeds by 1926, ready to start a new chapter in his adventurous life. At the age of seventy-two, Alexander, decided that being single was not for him. So, in 1926, he married sixty-four year old Ada Stanton Watson at St Chad, Headingly, Leeds. Ada, born in Heywood Lancashire in 1862, was living in Leeds at the time. She had married Thomas Watson in Fyle, Lancashire in 1910. Father Time eventually caught up with this remarkable man, and on September 13th, 1928, Alexander passed away at Wellburn Avenue, Leeds. He left £1628 to Ada. She herself died on May 21, 1935, and probate records show her to have been a lady of considerable means with effects at £6,340. Great-Grandfather Alexander, I would love to have met you! Race was born in Horbury in the third quarter of 1878, and given his mother's surname as his christian name. He was about ten years old when he arrived in Germany. I understand that he went to University there after his school days. 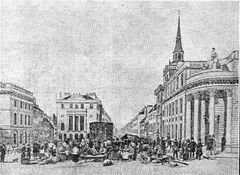 He eventually settled in Lodz, Poland and married Olga Isabella. His brother, William, was also living there in 1912, as a wool merchant, presumably staying with Race. 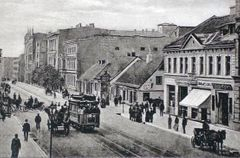 HUNTER Race of Nikolaistrasse 53, Lodz, Poland who was last seen alive on 5 dec 1915 and whose dead body was found on the 1 June 1916 in the sea off the coast of Essex. london 17 august to Alexander Boddie Hunter, gentleman Attorney of Olga Isabella Hunter Effects £113. 1s.8d. How Race came to be there remains a mystery. What became of Olga is not known, but Rita was brought to England, after the war, by Race's father, Alexander, and raised in Horbury by Stringer Hunter. There was an Olga I K Hunter who married an Arthur Jessop in 1936 but she isn't our Olga. 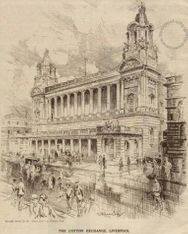 Sherwood was born in Leeds in the second quarter of 1880. His name reflects the esteem that Alexander held his artist brother George Sherwood in. He was about eight when he went to Germany and well into his twenties upon his return to England. Like his father, he was one of the true entrepreneurs of the family, starting his own engineering company “Sherwood Hunter Ltd”. Based in Penzance, Cornwall. and Washington,County Durham, he employed both his brother Franz and his brother-in-law, Roderick Chaddock-Lowndes. His uncle, George Sherwood Hunter the painter was also based near Penzance. Sherwood married Gertrude Elizabeth Gee on June 1st, 1911 at St Marylebone Parish Church, London. Stringer Hunter was one of his brother's witnesses. Gertrude was born on June 3, 1879 in North Walsham, Norfolk. She was the daughter of George Robert Gee, a manufacturer and coach builder, and Lucy Ann Russell of Sewells Cottages, Cats Pit Lane. She had a younger sister called Mildred Helen. Her father George died aged only 39, but her mother Lucy lived to be 94. A widow for fifty-three years, Lucy went to live with Sherwood and Gertrude in Penzance. Sherwood and Gertrude didn’t have any children. When his Uncle George and Aunt Constance died in 1919, Sherwood and Gertrude moved to their beloved Malthouse, left to Sherwood in his will, and lived there until Gertrude's death on March 23, 1937. Her own personal estate amounted to £3,845. 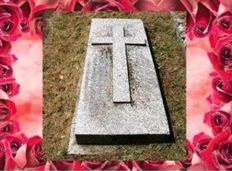 Gertude and Lucy are both buried at the Sancreed Church Graveyard in Cornwall. Following Gertrude’s death, Sherwood surprised his family, just as his Great-Grand-Uncle George had a century earlier. From the Southern most part of England, he moved to the Northern most part, to where his other business interests were. I would think his mother-in-law, Lucy Gee, remained at the Malthouse until her passing in 1946. 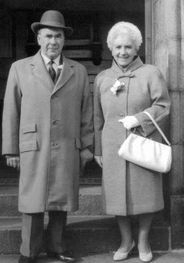 Sherwood met Charlesina Hurst of South Shields, born in 1917, and decided that he wasn't yet too old to have children. Ann was their first child. Barbara Hunter was their 2nd child, born on July 21st, 1940. Two years later, George S Hunter was born. How could there not be a George! A year later Catherine arrived. After waiting sixty years, what joy Sherwood must have felt. He lived long enough to see his new family grow up. He passed away in 1959 in Newcastle at the age of seventy-eight. Charlesina, known as Ina, passed away on November 2nd 2011 at the age of 94. Her funeral was on Monday, November 14th. One of her daughters has left an entry in our guestbook here. William, known as Willy in family circles, was the third of Alexander’s sons. He was born in Leeds on April 14th 1882. He was named after his father's illustrious eldest brother. William was also the name of his paternal great-great-grandfather and Alexander the name of both his father and great-grandfather. 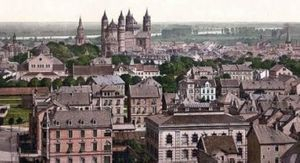 When his family moved to the Rhine, he attended Qealsch Primary School in Germany's oldest city, Worms. 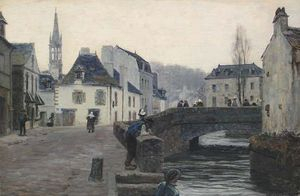 He attended Aberdeen Grammar School from 1898-99 which is interesting because the family were still living in Germany at the time. We know that because they were all absent from the 1901 UK census. 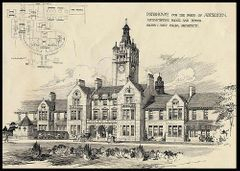 Aberdeen Grammar School records show William to be staying at 45, Stanley Street at the time with his uncle James, just as his brother Stringer would be at the time of the 1901 census. 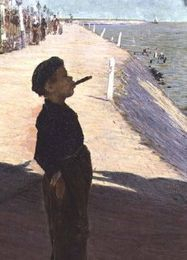 William left for Ludwigshafen in Germany after leaving school in 1899. This is across the Rhine from Manheim and Worms. There he went into the woollen trade as his father had. 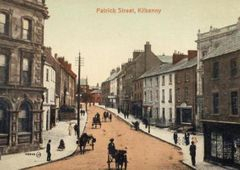 This eventually took him to New York in 1902, Saskatchewan in 1905, Kilkenny in 1908 and eventually to Lodz, Poland in 1909. There he lived with his brother Race who had married Olga, who was Polish. 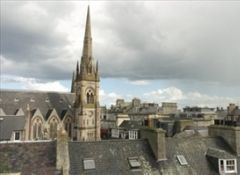 He returned to his father's home city of Aberdeen to marry twenty-four year old Margaret Gillies at the United Free Church in the Saint Nicholas area on the 11th April 1912. His brother Stringer was one of his witnesses. 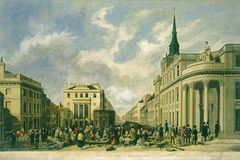 William was still living in Poland at the time as a wool merchant. Margaret was the daughter of Thomas Robertson Gillies and Mary Upland.Thomas was born on November 27,1850, the son of Archibald Gillies and Mary Robertson. They had a son James, one year older than Margaret. 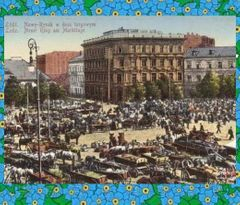 She and William stayed in Poland until 1914. 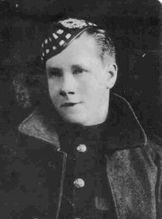 With the advent of World War One, William became a lieutenant in the 8th Battalion Cameron Highlanders on Jan 4th,1915. 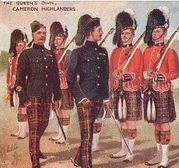 This regiment was one of the Cameron Highlanders reserve battalions. William was attached to the First Battalion Essex Regiment which was part of the famous 29th Division (the incomparable division).This was part of the Mediterranean Expedition Force that sailed to Gallipoli in April 1915 and disembarked on April 29th. This was the initial landing on the peninsular at Cape Helles. Some of the war's bloodiest battles subsequently took place with the Incomparables suffering losses of 34,000. The 29th fought for the duration of the ill-fated campaign and was one of the last divisions to leave in January 1916. 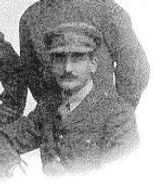 William, himself, served until November 1915 when he returned to the UK. The war wounds, from which he died after the war, were presumably sustained in this campaign. He joined the Intelligence Corps in April 1916, working in the Anti-Aircraft department until August 1917. From then until April 1918, he worked as a General Staff Officer at General Headquarters for Anti-Aircraft. He then worked as a Staff Officer in the RAF until April 1919, when he was demobbed as Major Hunter. 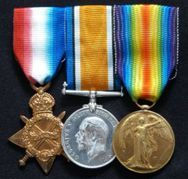 Post-War, he received the 1915 Star, British War & Victory Medals. 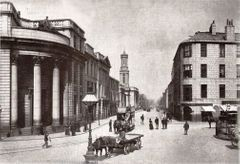 William moved to Liverpool and the Cotton Exchange there later that year. On the 15th of November 1921, he died in Liverpool, aged thirty nine. He had outlived his brothers Race and George but ultimately the Great War had claimed three of Alexander and Sarah's six sons. Margaret found herself a widow, like so many others, having hardly known her husband. Bless you William. You are remembered in these pages. Stringer played a very special part in the creation of this part of the family history. If he hadn’t gone to stay with his Uncle James in Aberdeen circa 1901, I may not yet have discovered the Hunter Family History beyond Alexander Boddie Hunter. I am very much indebted to both Stringer and the 1901 Scottish Census which opened the gates of Aberdeen to us. See that census under his uncle's section. He was born on the 3rd of April 1884 in Leeds. He was just four when the family moved to Germany, so most of his education took place there. The 1911 census records him living in Huddersfield as a foreign correspondent clerk with a firm involved with chemical manufacturing. During the war, he was granted a special appointment as temporary 2nd Lieutenant on June 1st.1916. We believe this to be in the Intelligence and Balloon Corps. He was graded for pay purposes a Staff Lieutenant 2nd Class, and he was subsequently promoted to Lieutenant, his date of rank being back-dated to that same date of initial commission. He was still serving at the end of the war. In 1925, he married Fannie Green. She was the youngest of three children, born to George and Fannie Green of Elm Lodge, Horbury. George William Green was a rag merchant by trade and a strong Wesleyan. George’s father had married Mary Stringer who was Stringer’s Grandmother Martha’s twin sister. Therefore Stringer’s Great Aunt Mary and Fannie’s Grandmother. See the Greens section. Fannie was better known as Rene, and she and Stringer settled in Horbury, living near to his brother Franz. Stringer had earlier lived in Huddersfield. Their first child, Irene Elizabeth was born in 1926 and went on to marry Peter Hawkswell, having two children. My mother often spoke of 'Cousin Betty!' She has made an entry in our guestbook here. Geoffrey was Stringer's second child born in 1930. He had been named after Fannie’s brother who had died in the war. Geoffrey married Marlene Hanson and they had two children. Eveline was Stringer's third child born in 1932 and died in 1979 without issue I think. Eveline was also the name of Fannie’s elder sister. Pauline was their fourth child born in 1833. Pauline may have been chosen by Stringer in memory of his sister-in-law, Ione’s, sister who died just three days old. Pauline married Frederick Brierley. They had two children. Their last child, George, now a very popular family name, was born in 1937. He married Mabel Crowfoot but no more details known, other than George only lived into his late forties. Stringer outlived all of his own five brothers, reaching the age of eighty seven. He died a year after Franz during the first quarter of 1972. By this time, Stringer was living in the village of Walton, near Wetherby, with his house delightfully named 'Nimrod'. See above. George was born in 1888 in Worms-on-Rhine, Germany. His middle name is derived from the surname of his aunt Constance who married his uncle George Sherwood Hunter the year after his birth. He was educated primarily in Worms and later back in the UK. 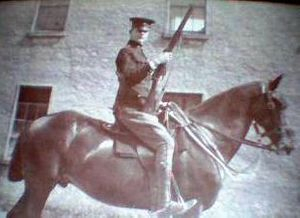 He served in the South Irish Horse Regiment between 1909 and 1910, during the time he and his parents were living in Kilkenny. George took up the family vocation of cloth manufacturing. He also boxed the World Heavyweight Champion Jack Johnson in an exhibition bout in Leeds, circa 1912. Jack Johnson toured England and France giving such exhibitions, while in exile from the USA. He enlisted with the Army Service Corps in September, 1914 in York, and was posted to 2 Base Remount Depot as a private, regimental no. RTS/2942. He disembarked in France on September 26th 1914. He was commissioned a 2nd Lieutenant in the ASC on the 16th July, 1916, and promoted to Lieutenant on the 16th January, 1918. He was awarded the Military Cross, posthumously. It is more than likely that he served with one of the Horsed Transport Companies given his previous experience. At its peak the ASC numbered 10,547 officers and 315,334 men. The main role of the ASC was transport, they were responsible for the movement of all supplies required by the Army, including food, fuel, ammunition, horses, clothing and equipment. Although never directly involved in trench holding, raids or attacks, these were the men who operated at munition and supply dumps just behind the lines. The ASC suffered 20,000 casualties in WW1.This news clip gives a fascinating insight into the ASC's work. George didn’t marry and died from war wounds on the 10th of November 1918. He was buried in Caudry British Cemetery, Nord, France, grave I. B. 19. His family were presented with his 1914 Star, British War & Victory Medal in the immediate post-war years. The Kilkenny Moderator of 20/11/1918 ran George's obituary, which noted ... "his father had been manager of Kilkenny Woolen Mills, and that George had been on holiday in Germany when the Great War broke out, but managed to get out with one of his brothers and enlisted at York in September 1914. He was later commissioned and was mortally wounded while leading his company into action on 5/11/1918, attd to 13th Battalion Rifle Brigade. His father was noted as being a Councillor for Leeds and his uncle as the late Dr. W.A. Hunter, MP for North Aberdeen." Franz Rudolf Hunter 1890-1971– see his life story in the Chaddock-Lowndes section. The Boddies and the Hunters came together with the marriage of James Hunter and Margaret Boddie on the 13th July 1843. See their family details earlier on this page. These were the parents of Margaret Boddie, the wife of James Hunter, and therefore they are my great-great-great-grandparents. John was a millwright from Kemnay, a village fifteen miles west of Aberdeen and famous for its granite. He was christened on 20 March 1787, the middle child of five born to Alexander and Isabella Boddie. 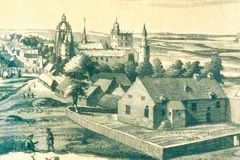 Margaret Youle came from Chapel of Garioch, about five miles from Kemnay. She was brought up at Fetternear Farm where she was born on the 3rd August 1791 and baptised two days later. She was one of four daughters born to James and Margaret Yule. Her only brother being James. 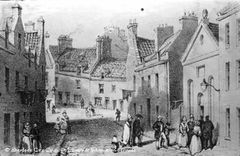 John and Margaret were married on the 12th July 1817 in the Saint Nicholas part of West Aberdeen where they went on to raise their family. The 1841 census has them living in George Street with Margaret Junior a cotton reeler and John Junior, a printer. Isabella, Agnes and Alexander are also in the household. By 1851, they had moved to 66, Gerrard Street. Only Euphemia, their youngest child born in 1831, is with them, working as a Paper Black Labourer. However two of their grandsons are staying with them. Their daughter Margaret’s eldest son, William Hunter and their daughter Agnes’s youngest son, William Duthie. The 1861 Scottish Census finds Margaret now a widow and living alone at 76, Chapel Street in the Old Machar part of Aberdeen. So John must have passed away between the two censuses. Margaret died on the 6th July, 1862 and is buried at the Spital Cemetery, Aberdeen.This is now part of St Peters Cemetery. Spital comes from the word Hospital or in this case, St Peters Hospital, a hospice for retired priests. Agnes was John and Margaret’s third child. She had married George Duthie in 1843, a month before her sister Margaret’s marriage to James Hunter. 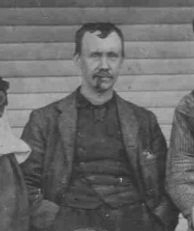 Their eldest son, John Duthie, born in 1844, emigrated to Ontario, Canada where he married Mary Miller with their son William Duthie born in 1848. Agnes had two daughters also, Ann and Margaret, born in 1847 and 1851 respectively. They lived at 82 Chapel Street, Old Machar,Aberdeen. He was a printer by trade. 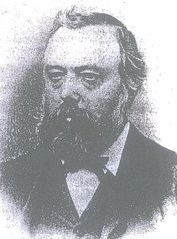 John and Margaret’s youngest son, Alexander Boddie, born in 1829, was a Librarian Mechanics Instructor by trade, and his sister Margaret named one of her sons Alexander Boddie Hunter. He married Mary Davidson of Peterculter, Aberdeen, but when and if there were children I don’t know. The 1881 census shows them living at 10,Thistle Street. Mary died in 1887 and Alexander had taken in lodgers by the 1891 census. 1901 finds him as the only lodger at Mary Whitecross’ house at 34,Union Street. They are both seventy. Alexander died on the 16th September 1905. Euphemia was born in 1831, and christened on April 9th. She was John and Margaret's youngest child. She married 25 year old Alexander Anderson on July 13th, 1855, in the St Nicholas part of Aberdeen. They had four children - see their details at the end of this section and above. Alexander, christened on 7 April 1830, was the son of William Anderson and Mary Gibson, both born in 1810. Euphemia and Alexander's eldest daughter, Margaret Yule Anderson, born 8 June, 1861, emigrated to Singapore with her husband James Smith Scott, a master mariner, born in Aberdeen on 12 July, 1856, the son of George Scott and Isabella Jolly who had married in Aberdeen on 16 May 1840. Euphemia passed away in 1904, 3 years after Alexander's passing in 1901. Their daughter Margaret will now be the main focus here. Her marriage to James Scott gained Margaret several brothers and sisters in law! These included John - born 12 Feb 1841, another John - born 28 Nov 1842, Isabella Catharine 7 June 1846, Ann Mowatt 6 Nov 1848, George 11 Aug 1850, Ann 23 May 1852, Jane 18 Jun 1854, Elizabeth 23 June 1858, Devina Smith 11 July 1860, Mary Ann Urquhart 27 April 1862, Jessie 25 March 1864, and finally ... James Shaw 2 July 1866. I include all of James' siblings with birth dates because family knowledge is priceless and there may be budding Family Historians interested in these details. When access comes one's way - it's nice to share it. Margaret and James had their first child in Aberdeen on 6 January 1887 with the birth of Mary Davidson Forrest Scott. On September 8, 1891, Isabella Jolly Scott was born, named after James' mother. A 3rd daughter, Euphemia Chapman Boddie Scott, was born in 1896 but died the following year in Aberdeen. Another daughter, Alexandra Anderson Scott, was born on 28 Nov 1900 in Singapore. 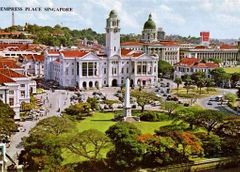 So Margaret and James' move to Singapore took place sometime between 1897 and 1900. Alexandra went on to marry Sydney Upton (born 23 Aug 1884 in Rugeley, Staffs) on 21 Nov, 1923 in Singapore. They eventually moved to Australia in 1928. Their son, Murray Upton, has compiled a family history and was my first contact of many in the making of my own family tree at Genes Re-United and in due course, this website. Thank you Murray. Margaret Scott lived to be ninety-six before passing away in 1957 in North Tamborine, Queensland.. She had been a widow for 32 years, James having died in 1925 at the age of sixty-nine. These were the parents of the aforementioned John Boddie and yes, they had one less ‘d’ in their name. To think that I had put the family history on ice for seven years because I had hit a brick wall on the Hunter/Boddie side. Suddenly, I have two great-great-great-great-grandparents on that elusive side of the family in Scotland. My Aberdeen roots are no longer a mystery! Particularly fitting because during Sir Alec Ferguson's extraordinary time at Aberdeen Football Club in the 1980s, I found myself supporting the team as wholeheartedly as if I lived there. Well my ancestors did live there. Alexander was baptised on the 7th January 1749, in Belhelvie, a small village outside Aberdeen, the sixth of seven children born to William Bodie and Jean Sangster ( my great-great-great-great-great-grandparents!) He was a crofter by trade and married Isabella Boyne on the 16th November, 1780 at Kemnay, Aberdeen. Isabella was born in 1755, the middle child of seven, born to George Boyne and Margaret Colly of Kintore, Aberdeen. Their middle child, John, married Margaret Yule, as already chronicled. Details of their eldest children, George and Christian are not known but their second daughter Mary, born in 1788, married the delighfully named Alexander Snowie, a stonemason, in 1811. The 1841 census has them living in Kintore with daughters Elizabeth, aged twenty and Margaret, aged five. Mary lived well into her 80s. Alexander and Isabella’s youngest child, Margaret,was born in 1793 and died on the 4th of April 1875. Further details are not known. A word about Alexander's father William. He may have been born William Body with his surname becoming Bodie in time. He names his third child, John, perhaps after his father. If this is so, then the William Body born to John Body and Elspet Watt in 1713 in Old Machar, Aberdeen, may well be our William. I do hope so because it would be nice to have an Elspet as my great-great-great-great-great-great-grandmother. It would also raise the Boddie tally of 'greats' to six! Though the Lessels would still carry the honours there ... you will meet them soon. Just speculation, and with John and Elspet marrying in 1693, William's birth twenty years later suggests that his parents may have been a different Elspet and John ... if these are his parents names at all! The rest of this history is definite fact. It just gets better and better for this family historian. Two more great-great-great-great-grandparents from Aberdeenshire. 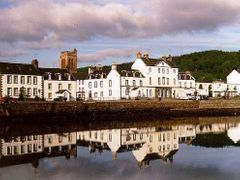 James was born on the 4th of April 1756 at Elphillock which is close to the small hamlet of Leochel-Cushnie, about twenty five miles west of Aberdeen. He was a general carter by trade, the son of William Yule. James had five brothers, Samuel, Moses, George, Alexander and William plus one sister. I must stop and salute William Yule here because he adds yet another 'great' to my growing collection. So, now we have no less than a great-great-great-great-great-grandfather in the aforementioned William Yule. Given my own American father's name, William Williams, William Yule is aptly named. But we mustn't stop there because IGI records record a father for William Yule ... step forward John Yoole. Incidentally, there are many variants of ' Yule '. 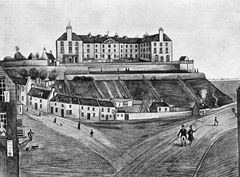 John was born in 1696 in St Nicholas, Aberdeen and adds a sixth great to my lineage. I have no records of his wife's name or other children besides William. However ... there is a record of John's parents who become my great-great-great-great-great-great-great-grandparents! William Yule and Isobell Smith. Their marriage took place in Old Machar, on April 23rd 1687. As well as John, they had James born in 1693, Janet born in 1700, and Isobel born in 1703. Margaret Lessel was born in Chapel Of Garioch, Aberdeenshire in 1755. She was the daughter of James Lessel and Jean Rough and may have been an only child. 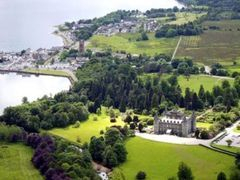 Her father James was the youngest child of Robert and Margaret Lessell, born in Monymusk, Aberdeen in 1720. He had three sisters, Margaret, Elspet, and Elizabeth, and a brother, Robert. Jean Rough was also born in 1720. Robert's father is also known ... please welcome Gilbert Lessel to our Family History—not to be confused with the famous cricketer Gilbert Jessop who was not a member of our family. So I have yet another Scottish great-great-great-great-great-great-great-grandfather. Thank you Gilbert Lessel. :) The Lessels have equalled the Yules in 'greatness'! This all results from Stringer Hunter staying with his Uncle James at the time of the 1901 census. That brick wall has been well and truly brought down. What a journey!! Back to James and Margaret Lessel ... almost forgotten in this sea of 'greats'. They were married on the 25th March, 1785 at Chapel of Garioch and raised their family there, at Fetternear Farm Estate. Fetternear, literally, means “the land in front of the shieling hill”. 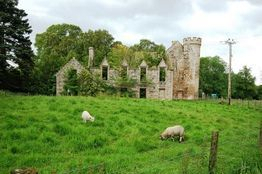 It was the medieval home of the Bishops of Aberdeen but at the time of the Yules living there, the Leslie Family owned the Estate. The 22nd Baron, John Leslie would have been James Yule’s employer and had just reclaimed the estate after legal problems. 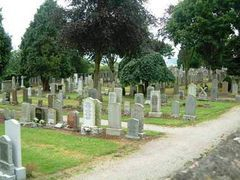 Margaret died on the 20th November 1823, aged fifty-seven and was buried at Spital Cemetery, Aberdeen. James was born on the 9th February 1786 in Chapel of Garioch, Aberdeenshire and christened three days. This was the year of the Fire Horse. He would see four sisters follow him but no brothers. He was a ship’s carpenter by trade and married Janet Dawson from St Nicholas, Aberdeen on the 2nd of May 1816. The 1841 census shows them living in Wellington Street, Aberdeen St Clements, along with other families. Their twenty-year-old son Hugh, a seaman, is with them as well as fourteen year old Alene who is a rope maker. Their fifteen year old daughter, Margaret Lessel Yule is also with them. Sons Keith and Alexander had already moved on, and James had died young. They had moved to 4,York Street by 1851. Twenty-eight year old daughter Jane was living with them and their their three- year old grandson Alexander. They were both seventy five years old by the time of the 1861 census with James still working as a ships carpenter. Still in York Street but now they were living alone. James died on the 23rd of January, 1874. As a fire horse, I would think that James was involved in the making of some very special ships! She was the eldest of the four daughters but nothing more is known of her except that she died on the 4th of January 1876. Like James she reached a ripe old age. Named after her maternal grandmother,Jean Rough,she didn’t enjoy the life longevity of her siblings.Born on the 28th June 1789, she died just a few weeks after her twenty first birthday on August the 3rd, 1810. Already documented earlier with husband John Boddie. She was my maternal great, great, great grandmother. Isobel was the youngest daughter, born on the 15th July 1793.Another cancerian like Jean. After this amazing adventure of the 'greats' of Aberdeen, back to Horbury now to meet the Races and the Stringers.